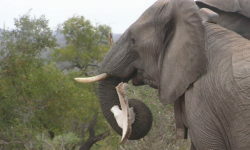 We offer advertisers a network of online channels to access and engage with our passionate community about Africa’s wildlife, people and travel. • Weekly newsletter – which focuses on the latest magazine issue as well as our most popular blog posts for the past week. ROCK STARS is our content marketing tool for lodges and travel agents/operators to engage with our audience on a more personal level via outstanding blog posts, online magazine features, photos and video clips. You provide the content and we will compile, post and market the blog and social media posts. All posts are subject to our editorial process and discretion, to ensure that our high standards are met. This is your opportunity to build your brand and generate bookings from our large and engaged audience. For rates and to discuss your personal requirements email Adie or Advertising. Our iconic weekly Stories and Galleries have carefully curated content that gets to the heart of Africa. Our contributors vary from seasoned travellers to field researchers, the world’s best photographers and of course user-generated content. All of our content can be viewed on any smart phone, tablet, laptop or desktop computer. Our weekly Stories and Galleries are published four times a month and offer space for both large and small weekly banner ad placements. The formats vary between long form story-telling and photographic galleries. Our blog is updated several times per day with fresh posts and offers three banner positions – leaderboard, sideboard and footer. We send a weekly email newsletter to opted-in recipients, featuring links to our best content on both the online magazine and blog . The newsletter is very well received and drives high value customers to our website. We offer an exclusive banner advert within each newsletter, linking to your website page of choice. ROCK STAR is a content marketing tool for lodges, using the very best stories, pictures and video clips to engage with your target market. It is an affordable way to generate travel leads and build your brand in the eyes of travellers by getting your content to our worldwide community. Travellers use multiple resources to plan and book their holidays – including receiving travel inspiration and advice from their friends via social media. Humans are first and foremost visually and emotionally driven – we react to wonderful imagery that inspires us and evokes emotion, and we make our travel decisions based on those emotions. ROCK STAR content marketing is about tapping into that emotional energy and benefiting from those decisions, by getting great imagery and stories (YOURS) to a large, relevant and engaged audience (OURS). Download our Become a ROCK STAR PDF (1.16Mb) for more information. ROCK STARS use their stories, photos and video clips to build their brand in the eyes of our large and engaged audience, and to generate bookings. It’s affordable and easy to do, once you get the hang of it. We have the largest and most engaged online audience in the world of focused Africa fanatics and travellers – across our online magazine, blog and social media pages (Facebook, Twitter, Google+ and Instagram). You send us your photos and video clips, along with a brief description. Our team assesses each for likely appeal to our audience and we then upload, publish and market your content on our blog, photo galleries, online magazine and/or social media platforms. 4. Why photos and video clips? Humans are a visually-driven species – great photos and video clips catch the eye and generate engagement. Every photo and video clip tells a story – it’s up to you to get your photos and video clips telling your stories to the world. By putting your stories, photos and video clips through our editorial and publishing process, you get to benefit from our years of experience in this space and to maximise your ROI. You also generate search engine and social media algorithm benefits via linking and tagging. Our large audience trusts our editorial process, which is why we are able to achieve high engagement. The emphasis is on high quality, low volume. Stories, photos and video clips that do not meet our standards will not be published. This is survival of the fittest, in digital form! Our most successful ROCK STARS source stories, photos and video clips from their guests and guides. Sourcing excellent photos and video clips is probably your most important marketing exercise. AG’s community manager will assist you with the process of getting your content out there onto our blog, online magazine, photo galleries and social media platforms – with instant exposure to our worldwide audience at the touch of a button – giving your business that extra boost in online publicity. 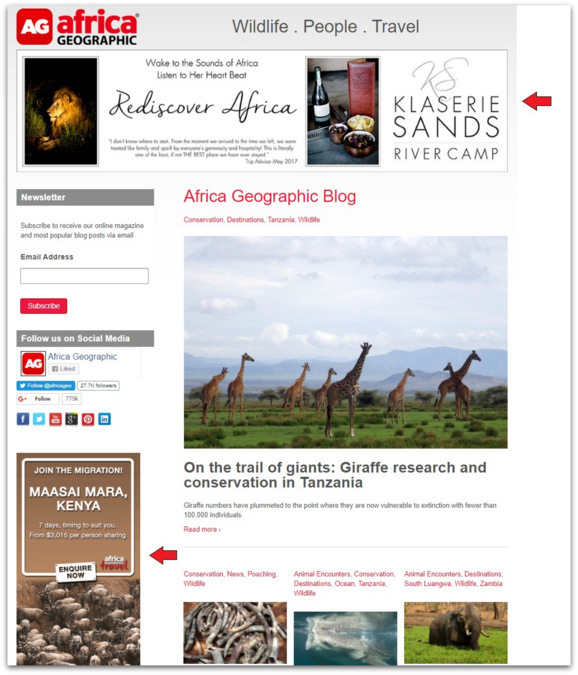 “Africa Geographic is the perfect fit as a content marketing partner for African safari properties and businesses. 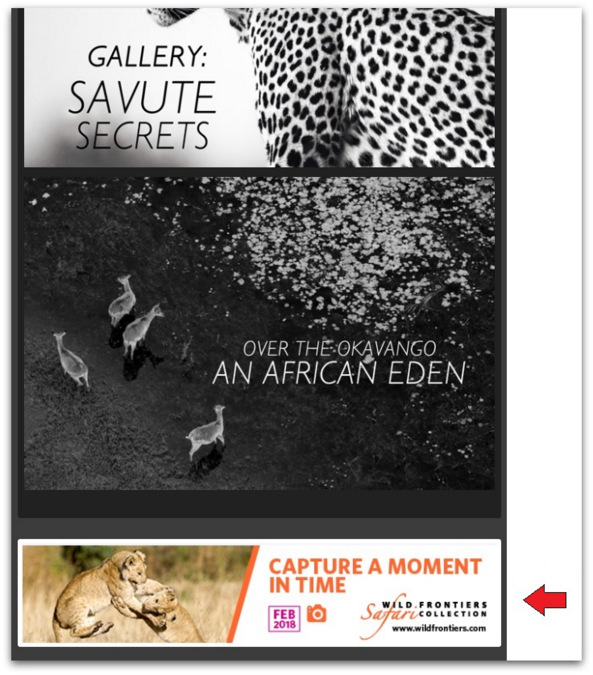 I work on various digital marketing campaigns for safari clients including Robin Pope Safaris, Airlink, Journeys Discovering Africa, The Ant Collection, Tongabezi and many others. 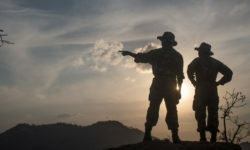 I am so happy with the effective exposure opportunities we can naturally create for them though AG and I recommend a ROCK STAR partnership as an effective and extremely rewarding way to connect with a relevant and travel-interested readership, through sharing real experience-based stories. 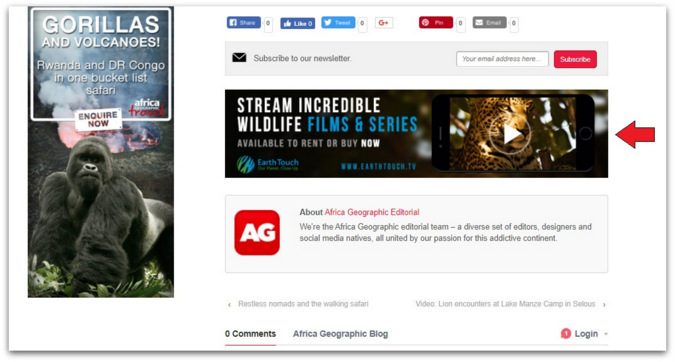 Personally, I love and relate to the content shared on the publications and platforms managed by Africa Geographic and see it as being its most valuable asset. 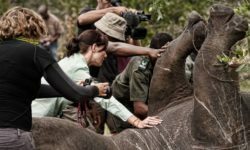 We regularly share our portfolio of lodges’ content with Africa Geographic and see interested and natural referral visits come to our websites as a result. And of course, we enjoy interacting with potential future guests and fellow Africa-lovers over social media interaction created too. “You recognise that feeling? You just spend countless hours writing blogs and on social media, etc. only to find out that not more than 15 people gave it a like and only two went as far as sharing it? These are often the real but depressing results for those trying to get their name out through social media marketing. 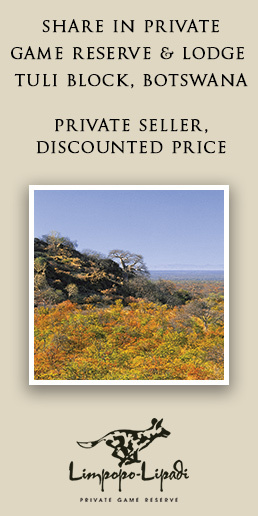 Certainly for us from Tailor Made Safaris, it seemed to cost a lot of time for minimal results. 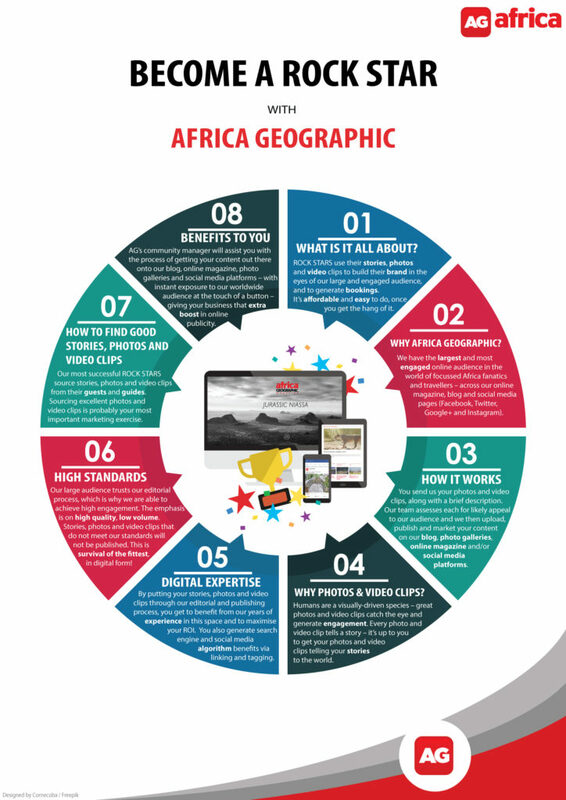 That is where Africa Geographic’s ROCK STAR content marketing came in! Now our same content gets seen by literally thousands of people, who like and share it and in doing so get our name out. 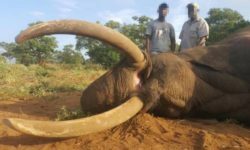 The results are clear, people start to click back to our own Facebook page and start to follow it, and statistics from our website show that various Africa Geographic platforms are one of the main ‘referrers’ to our site. Through commenting to replies on ‘our’ posts on the AG platform, we get to interact in real time with potential clients. We have found that being a ROCK STAR with AG really works and it is very reasonably priced. 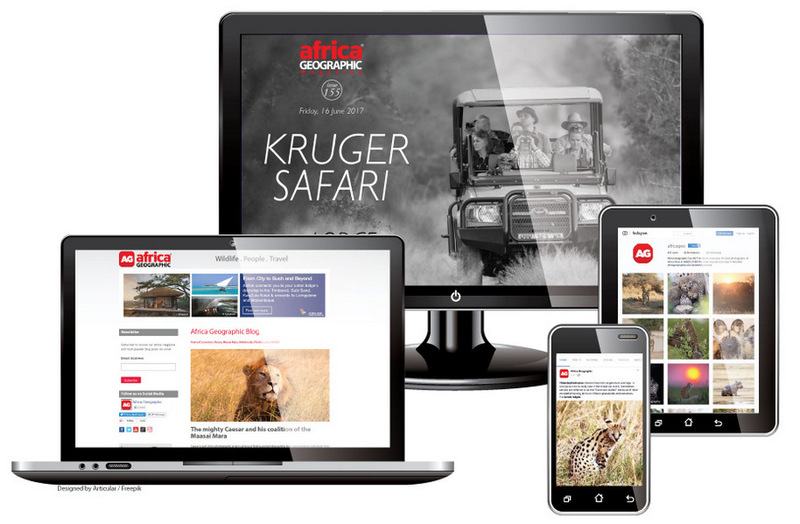 “We at Amakhosi Safari Lodge love working with Africa Geographic’s content team as we have found them to be very proactive and most helpful.